So rapid is the pace of deficit spending by the federal government, that the National Debt has increased over a trillion dollars since President Obama took office. On Inauguration Day, the Debt stood at $10.626 trillion. The latest posting from the Treasury Department shows that as of July 31st, the debt hit $11.669 trillion. 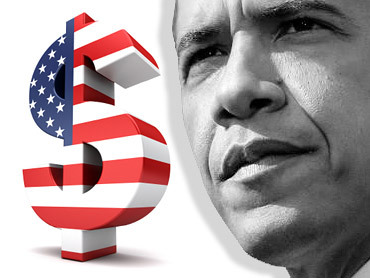 During the last administration, it took over 2 ½ years for the National Debt to increase a trillion dollars. But by the time former president George W. Bush left office, he had run up the deficit by a record amount: $4.9-trillion over eight years. A great deal of current deficit spending was already in the pipeline from the Bush administration and Mr. Obama, anticipating this day, said that increases have to be kept in perspective. "They basically handed me a bill for $1.3 trillion and said, 'Here, fix it,'" insisted the president last week at a Town Hall Meeting in Bristol, VA. "And now they're on TV saying, why haven't you fixed it yet -- in the middle of the greatest recession since the Great Depression." But since Mr. Obama took office, Congress approved his $787-billion stimulus plan. In addition, the new Administration had reign over the second half of the $700-billion bank bailout program. "Look, I understand the concern about debt," Mr. Obama said Thursday in Raleigh, N.C. "I'm looking at these spreadsheets every day. We dug ourselves a deep hole." And he concedes that the recovery package enacted on his watch has added to the problem. "We're going to have to tighten our belt," he said. But he was quick to add that it cannot be done "just as the economy is coming out of recession. No economist would recommend that." He says he understands those who believe the government is way too deep in red ink for him to pursue a trillion dollar program to overhaul the system of health care coverage in America, but he remains adamant about it. And he says that in the long run – over ten years - his plan will be deficit neutral and end up saving taxpayers money. "We're not going to make progress on the deficit without dealing with health care," said spokesman Robert Gibbs today. He said the administration doesn't think it can get the deficit under better control until it gets the economy moving again – and Mr. Obama believes health care reform is an indispensable part of that strategy. The budget numbers issued by the Administration in May project the deficit in the current fiscal year will top $1.8-trillion dollars. But an updated report is due this month, and an even larger deficit is expected to be announced for the current fiscal year, which began October 1st – 3 ½ months before Mr. Obama was sworn in.